It is long known that in cities there may be a significant climatic effect due to urbanization - thus in cities we have the interesting and challenging task of determining at least three significant drivers for change, if not more, namely the effect of the local modification of the environment as well as the local manifestation of global change due to greenhouse gases (plus, possibly other global factors). Unfortunately, systematic studies about the determination and separation of these effects - in principle a detection and attribution task - have not been done often. At least, I am not aware of such efforts; indeed even studies only on the size and distribution of the urban heat island effect (UHI) are not done often; in Hamburg, a first study was only published in the last few years - before that one could hear that in a maritime climatic environment as Hamburg, the effect would be negligible. It is not. 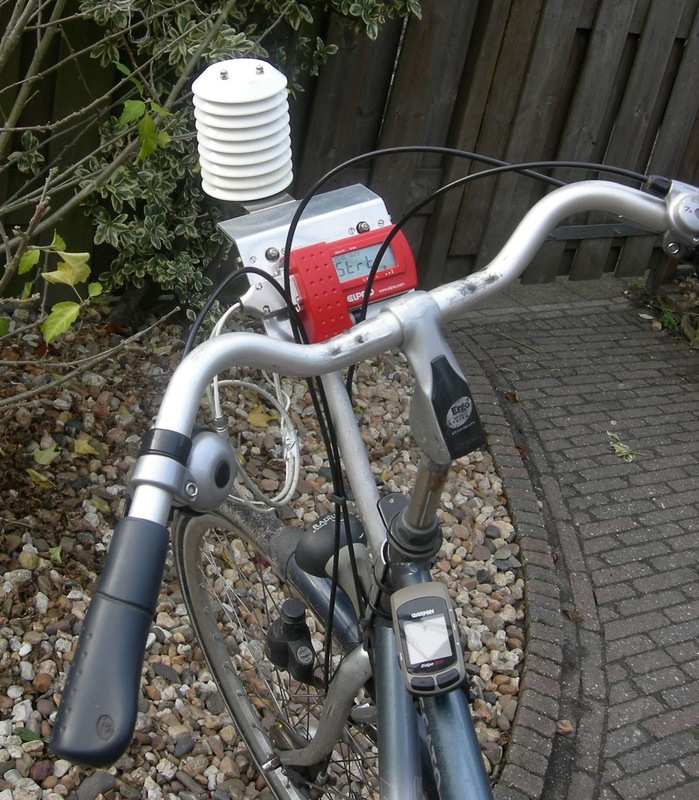 Mobile temperature and humidity measurements have been performed along a 14 km transect through the city of Utrecht (311,000 inhabitants) in the period March 2006 - January 2009. The measurements took place on a bicycle during commuter tra c and resulted in 106 nighttime profiles (before sunrise) and 77 daytime (afternoon) profiles. It is shown how the intensity of the urban heat island depends on wind direction, cloudiness and wind speed. Statistical models are constructed that relate the mean and maximum nighttime urban heat island intensity profiles to area-averaged sky-view factors and land use combined at both the micro and local scale. Sky-view factors are estimated from a 0:5 x 0:5 m surface elevation database and land use is obtained from a 25 x 25 m land use database. The models are calibrated using the mobile measurements and provide estimates of the spatial distribution of the mean and maximum nighttime urban heat island intensity in Utrecht. Both models explain more than 75% of the variance. A separate non-linear model is introduced that relates the temperature differences between the warmest and coolest part of the transects to wind speed and cloudiness. One would hope that more such innovative (and low budget!) projects would be done to help sorting out the important question, to what extend we are seeing in urban areas the effect of urbanization and of global warming, and to what extent planers could in principle seek to reduce the urban effect for mitigating the consequences of global warming. It appears that you do not look much at literature. Torok et al (Aust. Met Mag 2001) did surveys of a few Australian small towns and came up with the formula UHI (delta T) = 1.42*log(population)-2.09. Prof Ole Humlum has dome surveys across a number of towns including Oslo Norway and St Andrews Scotland. I note the UHI effect just about every day with the outside temperature thermometer in my Japanese SUV. The difference between suburban village centre (ie shopping centre, and post office which once was an official BOM weather station) and the urban rural outskirts is 1 to 3C day and night of which roughly a low difference of 1C occurs on cloudy days and 3C occurs on cloudless clear days and nights. The Village centre is always higher. Not impressed with the manuscript. It does not compare the urban areas with true rural or native vegetation areas. Cementafriend - you seem not to have understood the issue, namely the separation of two DIFFERENT signals. But I guess you are not alone in overseeing the obvious question. On the other hand, I have to congratulate you that you did somehow what Brandsma and Wolters did - you did it with a car, you did it on a random basis, no specific times, and you seem not to have published the result. I think we have first of all pay respect to Brandsma and Wolters for having done a fine and methodically innovative study. But they were not (yet?) able to study the 2-(or more)-signal problem. Forgot to ask - you explicitly mentioned your Japanese SUV. Was that merely a try to provoke some greens, or did you want to imply that measurements from such a platform - Japanese SUV - would be different from another platform, say a German Messerschmidt-Kabinenroller? Is it normal for you to be flippant? On another blog Dr Gavan Schmidt(of Real Climate blog) admitted he did not know about the Schmidt number named after another German engineer. Engineers and Professors of Thermodynamics Wilhelm Nusselt and Franz Grashof also have dimensional numbers named after them. Do you have better understanding than Gavan Schmidt? Have you studied the works of Prof Hoyt Hottel? I suggest that the great engineers mentioned would be turning in their graves over the incorrect assumptions and poorly put together papers produced by so-called climate scientist who have no engineering qualifications or experience. bit hasty in posting -busy right now. I should have put dimensionless numbers. Also, amongst the many engineering subjects (which include mathematics, statistics, economics, OHS, legal issues such as Environmental acts) are thermodynamics, heat & mass transfer, reaction kinetics, fluid dynamics and process control. well, the guy's name is Gavin who is actually a really nice person. thanks for the post... that is really a nice little project. IMHO, it also show a lot of passion, doesn't it? I tested the UHI at the weekend by myself. I did a bicycle ride from a village outside of Magdeburg along the Elbe to the city center. I was around 10pm and a clear sky night, almost no wind. Actually, the my "feeling measurement" found increasing temperatures pretty close after the city limits with increasing temperatures to the city center, where the thermometer showed over 20 something degrees (celsius). It was really astounding how big the difference was, in the feeling. The weather station is at the airport of Magdeburg. But, I did not come around there. But, one thing. My ride was along the river. Could the closeness to the river increase the difference? @Ghost - yes, that what I also thought: a nice project, showing a lot of passion. A meteorologist by heart! Maybe, some of our readers like to redo it in their way, presumably without a high-tech bike, but with an instrument and a GPS. If you think the river may have an effect, do a little detour! And, if possible, repeat the track! I do have a record of temperature recordings taken on a bike taken by old cycling computer. The typical curve would show a decrease in temperature as you ride out to the countryside and an increase when coming back. However, these cycling computers are bar mounted and sensitive to direct sun (I think the black plastic encasing does not isolate enough). Cycling over long distances takes several hours and therefore weather conditions have a direct impact (under dark rain clouds temp. decreases by 5 deg C., more when it actually rains). In fact for Holland bike traverse measurements have already been taken in several cities over the country (Utrecht,Rotterdam, Arnhem, Tilburg), including thermal comfort. Results for these traverse for Rotterdam have been reported here: http://www.wur.nl/NR/rdonlyres/5F932193-414C-4A91-B1F9-119362FC63FE/110556/Heusinkveld_Biomet_extended_abstract_26feb2010s.pdf. Thanks, G.J. Steeneveld - could you possibly add the bibliographic details of this study? This is a nice idea. We had some mixed results with Conrad Electronics "met stations", calibrated against real ones, years ago. They seemed to be pretty accurate, when they worked, which was not all the time. But with a selection round (different makes vs. real station), and then deploying lots of them, you could get some good data I guess. You are perhaps unaware of MEGAPOLI and related climate studies of large cities, their local climate and their global effects? I'm not good at detecting the difference between ill-meant sarcasm and sharp humour in blogland, so I choose to think that the sharp comments were funny in the original German. Ha! Ha! That over - Jones, Mann, Hansen et al have used the charge that the skeptics don't do original research, publish in peer-reviewed journals as a way to dismiss objections to their narrative. As all have said, it doesn't take a weatherman etc. Even as a kid outside Ottawa, I learned about the UHIE when the radio station reported the temperatures as X at the airport (where the temperature was measured) and X-0.5C "in the Valley", i.e. anywhere but the airport, where people lived. Of course, that was just a guess, but we understood the idea. Now you and other citizen-scientists are putting numbers to the truth we always knew. This must be driving the Team nuts. Romm and friends, also. Watts, Tallbloke, various on bicycles, the guys in New Zealand (brain freeze here, sorry! ): doing real observation of the variation "assumed" neglible in temperature measurements and finding that the variation is a huge portion of the claimed CO2 signal! How many such studies will it be before a collection of them - peer-reviewed, of course - in a special edition of some climatological journal will drop a stinking mess onto the warmists' doorsteps? The only way the skeptics can make a Deep Impact on the CAGW silliness is to pull all these together into a study that gets introduced to Congress and other parliamentary bodies. If serious doubt to the level of 0.4C in the temperature record can be entertained, all other - I repeat, all other lines of evidence, modelled and observational, collapse. If the world has warmed up not by 0.8C but by 0.4C, then there is no dangerous temperature rise attributable to anything but nature. It can't be CO2 because "their" models say CO2 doesn't behave this way. An uncorrected UHIE effect of 0.4C will propagate through the temperature record as the rural "corrections" are uncorrected. Without the apparent stimulus, the melting of Greenland can't be attributable to greenhouse gases - which is why the sealevel hasn't been rising as the models want it to. Tuvalu won't drown, and Al Gore's seaside mansion will maintain its property value. "Global" warming has looked like regional warming to me for some time. It is only in the mathematically correct but untruthful averaging operation that a strong regional signal has become conflated with a SIGNIFICANT global one. Urban effects are regional, but they contaminate the "global", i.e. rural, data through homogenization and averaging. The day is coming closer when the IPCC nonsense will become too clear to be politically effective, given its cost. It is not doubt that the warmists fear and hate, but data. Good for you! I have enough trouble multi-tasking my life to include balancing my checkbook. Thanks for doing what is in my benefit but outside my capability.